Vortex Generators (VGs) have been around for some time now, although their application in Formula 1 has been quite recent (as far as I am aware, so I’m probably wrong). They have been used on road cars to reduce the coefficient of drag and are also found on airplanes of the stunt and passenger variety to allow them to travel at a higher range of speeds and angles without the wings stalling. Since the beginning of 2012 teams have been searching for ways to push the exhaust plume down onto the floor of the car after Exhaust Blown Diffusers (EBDs) were banned at the end of 2011. 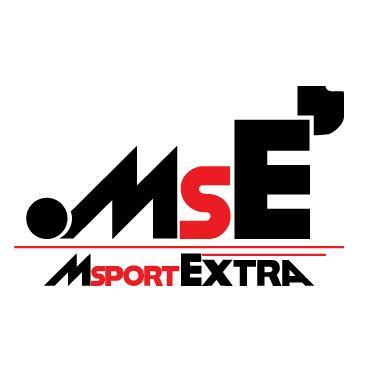 The best way to get a higher volume of exhaust gases to the edge of the diffuser is to place the exhaust pipe exit as low as possible (within the regulations). What this causes, however, is a sharp descent of the sidepod as it extends to the back of the car. Such a change in gradient can cause airflow to separate very quickly causing boundary layer thickness to build up. The oncoming airflow will therefore not have a significant impact at redirecting the exhaust plume downstream. 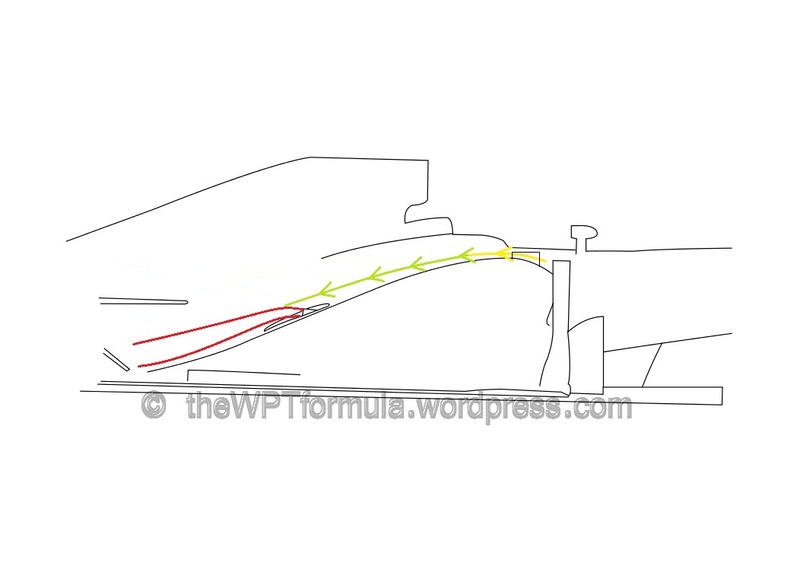 As you can see, the green arrow (representing oncoming laminar airflow) does not follow the path that the descending bodywork takes towards the exhaust pipe exit. The area between the arrow and the bodywork is the boundary layer, growing ever thicker as the bodywork slopes away. The boundary layer is a turbulent region of air and causes drag as it is travelling very slowly relative to the laminar airflow passing above it. 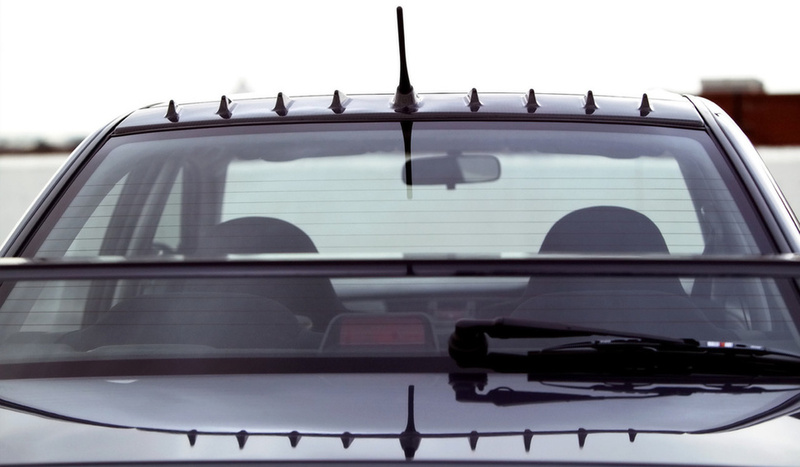 Ever wondered why the rain drops on your car windscreen are not travelling at the speed you are going down the motorway? Well, they’re in the boundary layer so they do not travel as fast. And here lies the problem. The laminar airflow can only reach a small volume of the exhaust gases being projected from the pipe. The result is that a large percentage of the gases emitted do not reach the rear of the floor of the car, which will not provide as much downforce. There are also a number of variables that may cause instability at the rear of the car as a result, but the VGs help cure them. How does a VG work? A Vortex Generator is a small, thin, rectangular (although they are often delta-shaped) piece of bodywork that can be found in a variety of places on a vehicle as it is used for different applications. If we use the above example, VGs were placed on the trailing edge of the roof of the Lancer Evo to reduce boundary layer buildup and pressure difference upon the rear of the car. VGs interact with eachother to produce vortices in a specific direction. On the Lancer Evo, the straight VGs were spaced 100mm apart to produce an amplified vortex. If you want to direct vortices to a desired area you can place them closer together, have them at different angles, or both. Normally, the height of the VG is set at roughly 80% of the boundary layer thickness. This is because the boundary layer does not end abruptly to the laminar flow above. There is instead an exponential relationship of slowly increasing airflow speed the further away from the surface of an object that the airflow is passing over (if that makes sense…). y=0 represents the bodywork surface. As the distance increases from the surface, the higher the airflow velocity. By setting it at this height, the top edge of VG is able to interact with the higher energy laminar airflow above, bring it down into the boundary layer and re-energise it. The mixture of airflows creates a vortex that spirals away from the trailing edge of the rectangular fence. And that is how it works! Lotus may have been the first team to run a single VG on each sidepod at the start of 2012, but McLaren were the first to introduce a pair of VGs to their car at the Spanish GP later in the season. As you can see, they are not very tall but are quite long. These two dimensions are very important when considering VG design. Thickness, warp and alignment are also highly regarded during the installation of these devices. The taller the VG is, the wider range of airflow speeds it can create vortices. The reason why this is the case is because the boundary layer thickness varies with flow speed. 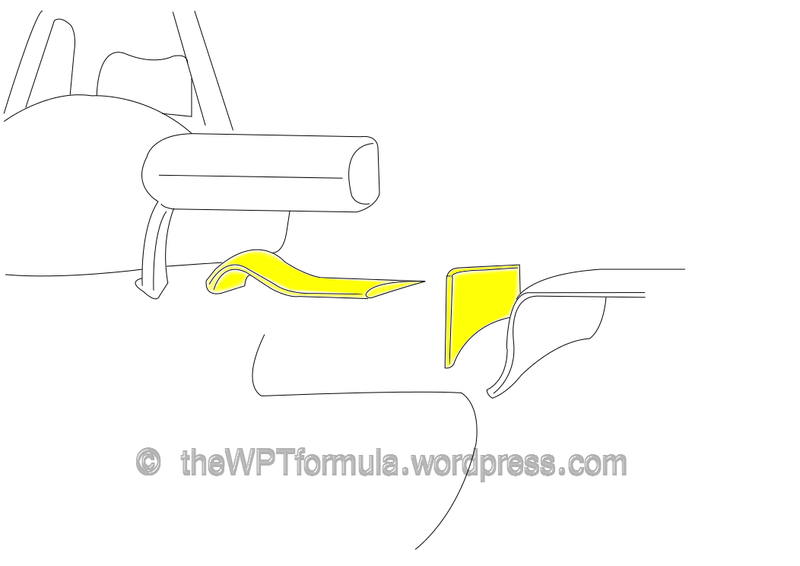 The higher the flow speed coming over the sidepod, the greater the boundary layer thickness. This is due to viscosity of the air/friction of the bodywork and how the laminar flow expands as the bodywork drops away. If you want to produce vortices over the top of the exhaust plume at high speed, taller VGs are your best option. At lower speeds, the vortex production will vary as the VG protrudes highly into the laminar airflow, although this can be supplemented by the shape at the trailing edge of the VG to continue producing consistent vortices. Length is another key factor. The longer the VG is, the larger the amount of higher energy airflow is brought down to the boundary layer. This basically produces a bigger vortex. You may have noticed that no team has the same dimensions on their VGs to any other. This is because each team may want theirs to work at different ranges of airflow speed or the boundary layer on top of the leading edge of sidepod is higher than others. Some teams want to produce bigger vortices than others depending on the characteristics of their exhaust plume/layout. There are so many variables, but they all have one objective: to re-energise the boundary layer airflow, push the exhaust plume back onto the bodywork and travel backwards to the diffuser edges. Other than the traditional fence, there are other methods for producing downwash over the sidepod by inducing a vortex of some sort. The horizontal blade that spans across the sidepod has asymmetric sides, creating a pressure difference at its trailing edge as the airflow speed varies. These two pressure zones entwine, forming a vortex. 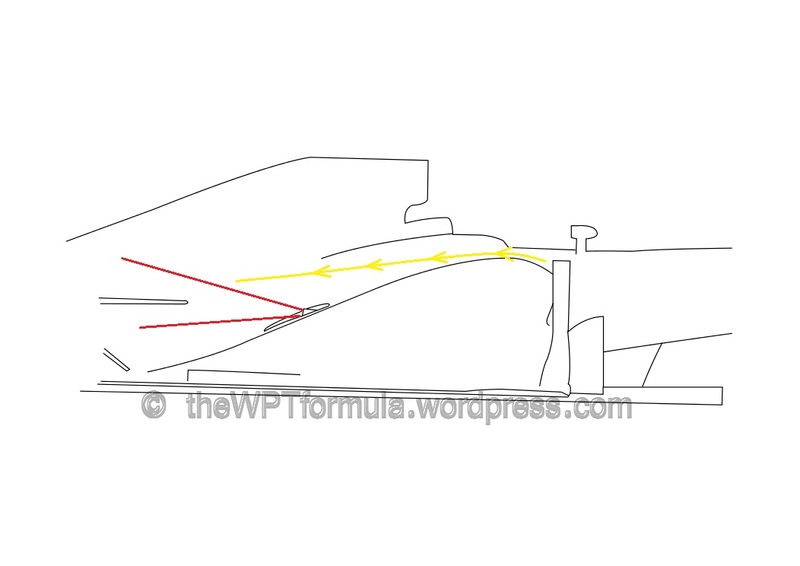 Sauber originally used this solution at the beginning of last year before Lotus and McLaren adopted it, with the former continuing to use it for the majority of this season. 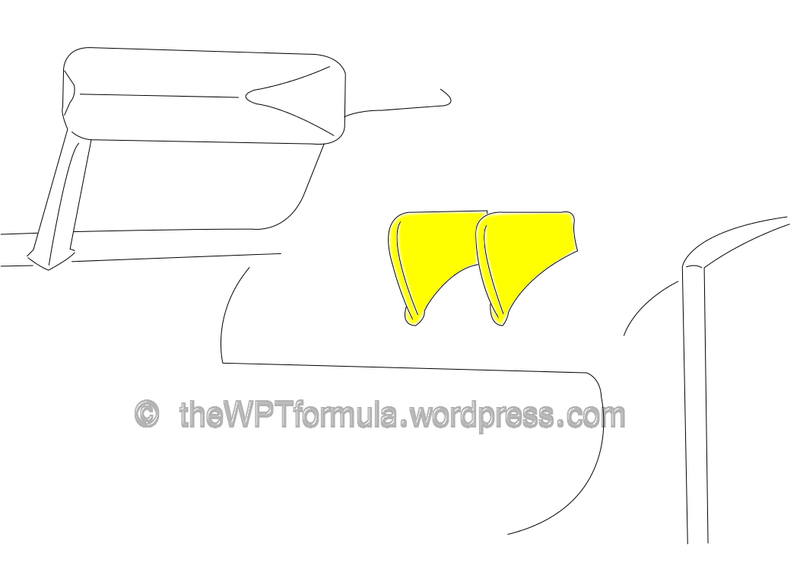 This entry was posted in Analysis, General and tagged f1, generator, how do vortex generators work, VG, vortex, what are vortex generators on September 30, 2013 by thewptformula. Cheers for that. I’m not technically minded (as you know), but that explanation was very clear.